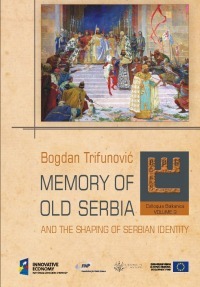 This book investigates the development of Serbian national identity in the context of the culture of memory that developed out of the discourse on Old Serbia, in the 19th and early 20th century. The term Old Serbia in the Serbian national discourse describes the lands once part of the medieval Serbian state, including the south of the Principality of Serbia and the adjacent lands under Ottoman rule from the 15th until the 20th century: the vilayets of Kosovo, Monastir and Salonica. Our hypothesis is that the discourse on Old Serbia became an element of collective remembrance only through the ideological deconstruction of the folk traditions, legends, and myths that formed the image of medieval Serbian history, in the second half of the 19th century. The political context of this process was Serbia’s strategic decision to expand towards the south, which emerged after the Congress of Berlin. The ideological concept of Old Serbia was created, and molded in order to correspond with the Serbia's new geo-strategic aims. This ideology of an ‘Old Serbia’ was the counterpart of the two other great ideas of the 19th century Balkan nationalisms: the Megali Idea and San Stefano Bulgaria. Our analysis of the mythical and ideological roots of Old Serbia (Chapter I), the production of memory of Old Serbia in textual, graphical and visual sources (Chapter II), and the reception of Old Serbia in visual arts and poetry (Chapter III) shows that discourse on Old Serbia was an important element of the national identity among the Serbs in the late 19th and early 20th century. The principal influence of the discourse on Old Serbia on the formation of Serbian national identity was its ability to connect as an unbroken bond, the Serbian Medieval Ages and modern state created after the uprisings against the Ottoman rule (1804–1815). The main source of this development was the contemporary Serbian intellectual, cultural and political elite and its construction of this continuity and permanent identity between the modern and medieval Serbian states, particularly with the 14th century empire of the Emperor Stefan Dušan. The bond between these two traditions was embodied in the tradition of Old Serbia.